The first one to upload video of Gordie Johnson's O Canada from tonight's Leafs game at the ACC wins a Coke. If you missed it, CBC broadcast the national anthems and Big Sugar's Gordie "Grady" Johnson played O Canada on his electric double neck guitar in Hendrix-like fashion. It was pretty awesome. Ladies and gentlemen, start your uploading! The United Nations has published its human development index which ranks its 175 members plus Hong Kong and the Palestinian territories. Canada is listed as the fourth most desirable country to live in. We used to dominate this list, finishing first nine times between 1990 and 2000. Here's the new top ten. A Place to Stand, A Place to Grow (Ontari-ari-ari-o!) is the unofficial anthem of Ontario. It was featured at the Expo 67 Ontario pavilion, so Ontarians my age and younger know it best from Jim Carrey's appearance on Late Night with Conan O'Brien when he came to Toronto for four episodes. It's cheese, but it's beautiful Canadian cheese, and it was written by Dolores Claman who wrote another Canadian classic, the theme to Hockey Night in Canada. Here it is, but consider yourselves warned. It's very, very catchy. If you know the song, you likely found yourself singing along. Here are the memorable lyrics that fill every Canadian with pride. For being the-uh Ro-oy-al Canadian Kilted Yaksmen! I don't have a personal story to relate about war. My grandparents didn't serve and I don't have an uncle or a cousin in the armed forces. I once heard about my grandfather's brother serving in WWII, but the details are sketchy. According to Veterans Affairs Canada, there are 205,533 living Canadians who served in WWII. There is only one living Canadian who served in The Great War. You don't need to have a personal story about Canada's participation in war to appreciate the sacrifice made by these brave men and women. Lest we forget. It's happening. At this moment $1 USD will buy you $1.0012 CAD. This hasn't happened since November 1976 when I was in diapers. AFP has released an article with a title that immediate caught my attention. "Canada's last igloo to be flattened amid Arctic boom" it read, so I read it. I've now read it twice, but my feeble brain is awfully confused. The gyst of the article is that our far north is suddenly developing, and a good example is the fact our last igloo is being demolished to make room for offices. I'm a city guy, and I don't know much about igloos, but I don't think "our last igloo" is an igloo at all. Here's a quote from the article. 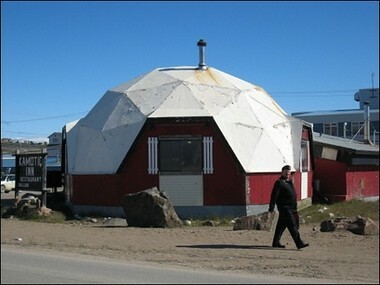 The eatery at the main "Four Corners" intersection of Iqaluit, just 200 kilometers (120 miles) south of the Arctic Circle, is the only extant example of modern igloo architecture, inspired by the igloo shape and popularized in the 1950s and 1960s, in the North. It was actually built in 1980 by two schoolteachers with the help of local townsfolk out of normal building materials. The couple was fascinated by the "igloo shape," said Suzie Michael, a former student who pitched in, hammering nails and painting the exterior. Sure, it's shaped like an igloo, but it's not actually made out of snow and ice. It's made out of "normal building materials". The Wikipedia entry on igloo calls it "a shelter constructed from blocks of snow, generally in the form of a dome". Mimicking the igloo shape does not an igloo make! I'm sure the Kamotiq Inn restaurant will be missed by locals, but it's not "Canada's last igloo", despite what the AFP would have you believe. Speaking of positive reviews for The Simpsons Movie, the Globe and Mail had a nice little collection of Cancon Simpsons moments in an article they called D'oh Canada. I like it so much, I'm reproducing it here in its entirety. The members of America's favourite nuclear family have shared a long love affair with their northern neighbours. Everything from the National Film Board of Canada, which gets a credit in the fake film Poke of Zorro (E-I-E-I-Annoyed Grunt, Season 11) to Gordie Howe, as the unsuspecting object of Ms. Krabappel's affections (Bart the Lover, Season 3), have been lampooned by the show's writers, including Calgary's Rob and Joel Cohen and Exeter, Ont. 's Tim Long (the guy you can blame for most of the gags in the Toronto-centric episode, aired in February, 2002). Homer lies on the couch, watching "exciting 15th-round action at the Canadian Football League draft." Monotone announcers can barely contain their excitement on how many rouges the Saskatchewan Roughriders scored last year. Lisa helps Homer bet on football games, and in researching the sport's origins at the Springfield Library, comes across an "oddball Canadian rules" card. When Lisa goes to the U.S. capital to compete in a national essay contest, fellow contestant Trong Van Din mentions in his eventual winning essay ("USA A-OK!") that his immigrant family's choice of a new homeland was easy: "Where else but in America, or possibly Canada, could our family find such opportunity?" When the teachers at Springfield Elementary go on strike and Marge fills in as a substitute, she bemoans to Homer how it took her class 40 minutes to find Canada on a map. His reply: "Marge, anyone can miss Canada, all tucked away down there." And in Girly Edition (Season 9), newscaster Bart reports a feel-good piece about Joe Banks, an 82-year-old man who's gone to the same pond every day for 17 years to feed the birds, only to have them suddenly vanish. To where? As Bart says, "Some say the ducks went to Canada. Others say, Toronto." Bart and Lisa attend a new school after Homer moves to Cypress Creek to start a new job for megalomaniac Hank Scorpio. After Bart gets shipped off into a remedial class, he meets a Canadian kid, Gordy, who congenially introduces himself: "I moved here from Canada, and they think I'm slow, eh?" In Bart's Friend Falls in Love (Season 3), Milhouse's romance with Samantha Stanky threatens to break apart his friendship with Bart, until her father gets wind of it and ships her off to a French-Canadian nunnery: "They're very nice," she says, "except they never let me 'oot.' "
Actor Rainer Wolfcastle and his daughter Greta go to Toronto for a movie shoot, and a love-struck Bart follows them. The rest of the Simpson clan comes along, with initial apprehension by Homer ("Why should we leave America to visit America Junior?"). As soon as they arrive, Marge falls in love with the city ("It's so clean and bland. I'm home!"). Homer takes advantage of the then-poor exchange rate with a security guard ("American currency! What time would you like your breakfast, sir?"). Bart takes in a very special episode of Curling for Loonies, then lands a spot on the Olympic basketball team - as a centre, no less. To bring affordable prescription drugs to Springfield, Homer and friends drive up to Winnipeg and smuggle back cheap pills. (Ned meets his Canadian doppelganger, who offers him a marijuana joint: "It's legal here!"). And in Homer's Triple Bypass (Season 4), Homer reassures Marge that his surgery will go all right since "America's health-care system is second only to Japan, Canada, Sweden, Great Britain, well, all of Europe, but you can thank your lucky stars we don't live in Paraguay!"